… he now regarded Makana with what looked like deep suspicion. “I'm honoured to have any kind of reputation at all,” said Makana before making his excuses. Sand, a burning truck, a group of blindfolded figures, roped together, staggering through a dust storm. An American soldier is rescued by Wild Bill Hickok and a Viking god who promise him safety just outside Fallujah. Makana, exiled Sudanese Police inspector turned private investigator, is crossing the river at sunset to meet his old friend Ali at the villa of the art dealer Kasabian. Tonight there will be a private view for Kasabian's latest show which includes a couple of Ali's paintings and Ali has also recommended Makana for some discreet enquiry work. Inside Kasabian's elegant home the guests circulate – fellow dealers, artists, clients, and the high and the mighty. In his office Kasabian explains to Makana that a New York art dealer has asked him for help in locating a rare Expressionist painting once thought lost during the Nazi's purge and pilfering of “decadent art”. There are rumours that the painting – alongside similar others – has re-appeared, looted from a private collection during Saddam’s invasion of Kuwait in the first Gulf War. The painting is thought to be in the possession of an Iraqi colonel currently on the run from the Americans and perhaps here in Egypt. Makana's job is to locate this Iraqi colonel for Kasabian. Nothing more, Kasabian will do the rest. After the reception Makana and Ali share a meal in a favourite café. Makana takes on the modern world by buying a mobile phone – and one for Ali too, who says he will fix Makana's ageing car, offending Sindbad, Makana's taxi-driver “chauffeur”, in the process. Ali asks about the rumour that Makana's long lost daughter is alive. But the reminder of the loss of his wife and daughter during the flight from Sudan spurs Makana to leave and take a solitary walk home. On the way he calls into a particular bar where, as he thought, he finds Marwan. Ex-State Security, Marwan has been demoted to CSF policeman – the Riot Squad – and Makana asks him to see what he can find out about the mysterious Iraqi colonel. Parker Bilal is the pseudonym of writer Jamal Mahjoub, born in London, brought up in Khartoum and now living in Barcelona. His retrospective crime series following Cairo-based private investigator Makana, a Sudanese exile, begins with THE GOLDEN SCALES set in 1998. (In an interview Mahjoub has said that he hopes to take the series up to the Arab Spring and the overthrow of Mubarak). 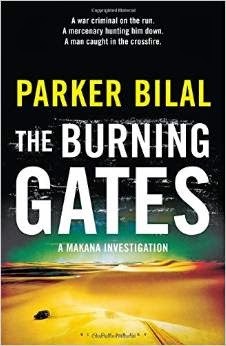 This fourth novel THE BURNING GATES is set in 2004, eighteen months after America launched its invasion of Saddam’s Iraq. In it we get an Arab/Egyptian perspective on the Iraq war, frequently relayed through the wry conversations of everyday Cairo street life. Bilal's writing is vivid and he excels at creating individualised characters. Some reappear throughout the series but there are also tiny cameos such as the bewildered and bewildering elderly witness, a poet, who says he saw a bolt of lightning, a yellow bird, or rather – a yellow motorbike. With each book we get to know Makana better. Not necessarily the details of his past, for his is a shrewd, observant character given to brief ironic remarks. But we do get a sense of his life as an outsider “from The South”, and as a political exile whose strange mix of caution and impulse makes for much of the suspense of the novels. Marked by the loss of his wife and daughter during their attempted escape from Sudan, Makana is frequently hooked by encounters that trigger his guilt and grief. In THE BURNING GATES this involves a young Sudanese woman who works as a hostess-prostitute in a nightclub, part of this novel's world of stolen art, art dealers, shady deals and corruption which soon opens out onto a vista of murder, brutality, duplicity, war crime and mercenaries. Don't miss out on THE BURNING GATES, nor for that matter the earlier books in this wonderful series.